Last week we gave you sneak peek at Deloris Franz, an antogonist from 5e NPCs: Bullies and Brutes. We know detailed histories and motivations are awesome, but since Deloris is intended to be used in an RPG, stat blocks are handy too, right? This coming Wednesday, January 18th, Dire Rugrat Publishing is releasing 5e NPCs: Bullies & Brutes. With nearly 40 pages of unique stat blocks, write-ups, and colour art, there’s plenty of NPC goodness. While all of the characters in the book are a bully of some sort, some prefer brawn and others brain; challenges range from 1/2 to 15. In 1895, U.S. President Grover Cleveland proudly sponsored the first electrically lit Christmas tree in the White House. It was a huge specimen, featuring more than a hundred multicolored lights. The first commercially produced Christmas tree lamps were manufactured in strings of multiples of eight sockets by the General Electric Co. of Harrison, New Jersey. Each socket took a miniature two-candela carbon-filament lamp. From that point on, electrically illuminated Christmas trees, but only indoors, grew with mounting enthusiasm in the United States and elsewhere. 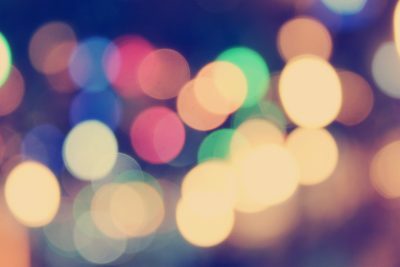 San Diegoin 1904, Appleton, Wisconsin in 1909, and New York City in 1912 were the first recorded instances of the use of Christmas lights outside. Over a period of time, strings of Christmas lights found their way into use in places other than Christmas trees. Soon, strings of lights adorned mantles and doorways inside homes, and ran along the rafters, roof lines, and porch railings of homes and businesses. While we all love looking at the bright coloured lights once the job is done, I’m not sure anyone enjoys hanging them. Inside you are tripping over decorations and fighting to get the string around the tree, outside it’s the ladders and the cold weather nipping at your fingers. Either way there is the tangled strings, the burnt out bulbs, and the sheer frustration. 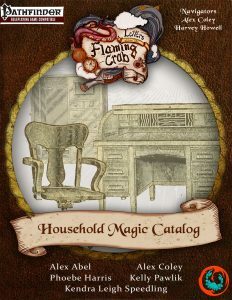 It got us daydreaming about possible answers, and with the recent release of Letters from the Flaming Crab: The Household Magic Catalog, the magical solution was right at our finger tips. Is the dreary dark weather of Yule time bringing you down? While warm fires and soft light brighten up the interior of your home, those dark evenings make the outdoors oppressive. Bring a little cheer to the outside of your abode with minimal effort. Our self stringing lights easily brighten up the exterior of any dwelling, and can be hung on a building, a tree, or a fence; the possibilities are limited only by your imagination. Slot none; Price 1,500 gp; Weight 200 lbs. This 50 foot length of green silk rope is studded at 6 inch intervals with tiny silver bells. Upon command, the rope snakes forward, upward, downward, or in any other direction the user wishes, at 10 feet per round. The delicate silk rope can fasten itself securely to rough wood, nails, and other non-slick surfaces as its owner desires. It can unfasten itself and return in the same manner. A length of easy-peasy yule lights can be commanded to light up for four hours. When lit, tiny globes of light form inside the bells and illuminate an area as a torch. The lights can appear as whatever colour or combination of colours the owner desires and can remain static or twinkle at varying speeds as desired. The process of creating easy-peasy yule lights weakens the rope they are made of. If they are subjected to more than twenty pounds of weight the length of easy-peasy yule lights snaps and become non-functional. If you are looking for other fun household items for a magical world, check out the latest release from Flaming Crab Games.